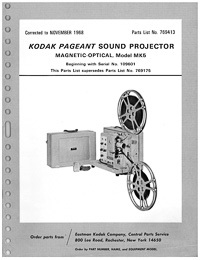 Kodak Pageant Sound Magnetic Optical Model MK4 16mm Movie Projector Manual Discounts Apply ! 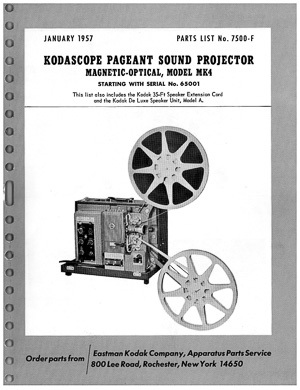 Excellent quality photocopy of the original 1957 Parts List for the Kodak Pageant Sound Magnetic Optical Model MK4 16mm Movie Projector starting with Serial No. 65001. 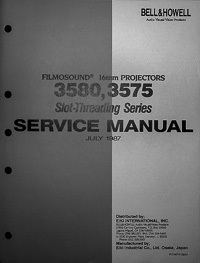 This list includes the Kodak 35-ft speaker extension cord and teh Kodak De Luxe speaker unit, Model A. 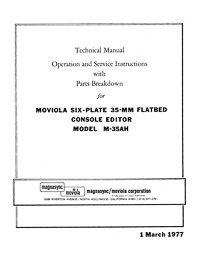 This 48 page manual is printed on double sided 11" x 17" heavy weight paper 8-1/2" x 11" heavy weight paper and it contains 2 double sided 11" x 17" fold-outs just like the original. It has a card stock cover and is plastic comb bound so it will lay flat on the workbench. 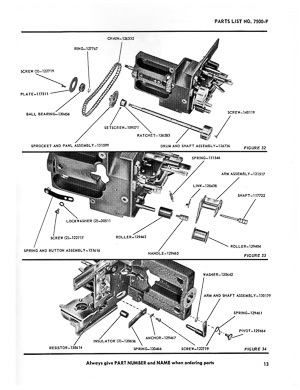 The heavily illustrated parts manual contains complete exploded parts views, parts lists and an electrical diagram.